This is a 1980 photograph of Barbara Bush and this is very much how she looked when I met and talked with her -- save that we (myself, her daughter Dora, and myself were bathing suit clad and were sitting in a sauna! I've written about this before -- several years before. I had the privilege of meeting and chatting extensively with Barbara Bush during a time of great difficulty in my own life. Her daughter Dora was with her that day that I met both at my health club in the Renaissance Center of Detroit. The year was the early months of 1980 preceding the Republican National Convention held in Detroit that year. My husband, Barry MacIntosh had suffered a nearly fatal and totally disabling accident that left him a bilateral above-the-knee double amputee. The accident had been the preceding October 15th (1979). To assist with the adjustment of living with the condition, Barry was going through rehab at the Detroit Rehabilitation Institute. It was suggested he should take a day out to see how he would adjust to departure from the long-term care. We were preparing to move to a building with an elevator, but that move was about 3 weeks away and clearly he would not be able to wheel chair navigate our downtown Detroit apartment with small stairs. I then had my office in Tower 100 of the Detroit Renaissance Center and a membership in the Renaissance Center Health Club. There were family privileges and so we decided that Barry, my son Stephen and myself would enjoy the day at the Renaissance Center where Stephen and I could swim, Barry would watch; we would then take dinner and a movie and return Barry to the Detroit Rehabilitation Institute. The rest of the story may be read by clicking here to read the account I posted to this blogspot 13 years ago, in 2005, then 25 years after Barbara Bush, Dora Bush, and myself had our chance informal meeting in my Health Club. She was a lovely and gracious lady -- we chatted as if we had know each other all our lives. I have had many fond remembrances of her since. News accounts informed the public that she had spent her last day with her hand being held by family members and her pastor reading Scripture and praying with her. May she rest in peace! ARE MAURICE STRONG'S OLD COMPATRIOTS ACTING OUT HIS DAVOS "SECRET SOCIETY" FANTASIES? Note to my Readers: I don't want to shut down the reading and discussion of the article I posted early Sunday morning -- the information in it is critical. NewswithViews.com has just published this article. I spotted two of my own typos in it but they are corrected here and I sent Paul Walter of NewswithViews.com the corrections for when he reviews them -- as Oregon time is 3 hours behind my Michigan time, the NewswithViews version might confuse, hence, I'm posting it here as well. PLEASE, PLEASE,KEEP READING AND POSTING TO MY OLD ARTICLE AS WELL AS THIS ONE -- THE CONTINUATION OF THE CULT OF THE PROCESS CHURCH OF THE FINAL JUDGMENT in the form of BEST ANIMAL FRIENDS SOCIETY is too critical to ignore! 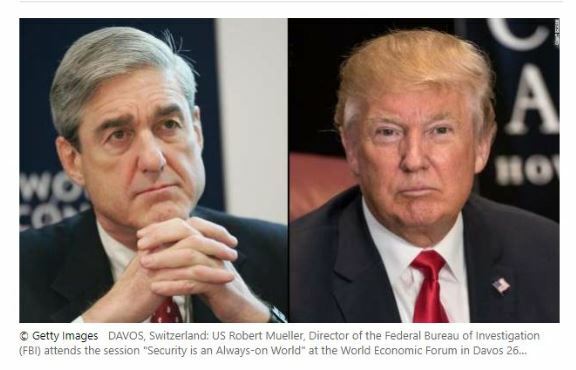 These are two separate photographs of Davos participants Robert Mueller and Donald Trump. taken at this year's Davos conference. A recent John Cassidy NEW YORKER article (January 26, 2018) reported that “Trump Makes Nice at Davos While Mueller Awaits Him at Home.” Well, not quite. Both Trump and Mueller were Davos attendees. Mueller’s was definitely more downplayed. Clearly from publicity surrounding the closed crowd Davos events, Mueller was the more favored participant of the two. In 1990, two years before the 1992 Rio Earth Summit event, Maurice Strong publicly fantasized to a Canadian Globe reporter about a novel he considered writing. It would be about a secret society being formed of Davos participants. If the wealthiest nations of the world wouldn't sign and implement a global compact, they would decide it their duty to collapse the global economy to bring the change about. They would have the sophistication about and access to the global levers to make it happen. "'This group of world leaders,' he continues, 'forms a secret society to bring about an economic collapse. It's February. They're all at Davos. These aren't terrorists. They're world leaders. They have positioned themselves in the world's commodities and stock markets. They've engineered, using their access to stock markets and computers and gold supplies, a panic. We know now from advance reports on James Comey’s new book that he considered politics in his actions before the Election. It is not unreasonable to assume that his marching buddy, Robert Mueller might well be doing so as well. Were Maurice Strong’s fantasies at least partially acted upon post Davos 2018? Was or is there a Davos “secret society” ? If so, did they invite Robert Mueller to help further their agenda? Behind a national network of animal shelters, including a greatly beloved one in Pontiac, Michigan, "The Michigan Animal Rescue League" lies one of the country's, if not the world's most notorious cults, the PROCESS CHURCH OF THE FINAL JUDGMENT a/k/a FOUNDATION CHURCH OF THE MILLENNIUM a/k/a FOUNDATION FAITH OF GOD. The Process Church founders had their roots in Scientology and moved on to form their own cult. Despite the current Wikipedia article saying no proof had been found of ties to Charles Manson, Manson himself in a prison interview freely talked of sending representatives from his cult to England where the cult began life. The cult now successfully masquerades as an animal benefactoring association, BEST FRIENDS ANIMAL SOCIETY. They are successfully lobbying in many states to enact legislation against "breed specific legislation." Their efforts are clearly directed at protecting the most dangerous breed of dogs from a human and other animal safety standpoint, the PIT BULL. They raise vast sums of money for their Pit Bull Rescue groups. I'm informed that the attorney for Best Friends Animal Society, Richard Angelo, presented the proposed the Michigan legislation sponsored by Senator David Robertson. The influential lobbyist who prevailed upon the Committee to change enough votes to let it out of Committee without a second hearing was John Lindley. He is a registered lobbyist with the Lansing based lobbying firm PAA (Public Awareness Associates). It was BEST FRIENDS ANIMAL SOCIETY who hired Lindley. The legislation passed by the Michigan Senate is the same as bills sponsored by the cult in 22 other states. Now, yes, there are nice pit bulls and nice people who own pit bulls. Unfortunately, some nice people with nice pit bulls have been killed or seriously maimed by their own animals. Seventy four percent of all dog bite fatalities have come from pit bull attacks. fifty three percent of those attacks involved a family member. Ten percent of the attacks involved sleeping infants. That breed was bred for violent tendencies -- most dogs bite and release. The Pit Bull does not release. Organizations seeking to educate on these statistics include DogsBite.org. Needless to say, the Process Church of the Final Judgment was and is an important New Age component. It does live on as a direct continuation in its present incarnation as BEST FRIENDS ANIMAL SOCIETY. It does not even try to hide its history or relationship to the PROCESS CHURCH. I'm now in personal alarm mode. The Michigan State Senate just passed 22 to 13 a bill banning breed specific legislation. The bill was sponsored by a Christian legislator in Michigan with Libertarian roots, Senator David Robertson. I had traveled with two friends to Lansing, Michigan's Capital to give testimony against the bill which would strip a municipality of power to protect its citizenry against dangerous dog attacks -- sometimes by banning a very dangerous breed; sometimes by requiring neutering to prevent local proliferation of the breed. Usually municipalities resorted to such ordinance creation only when a tragedy had preceded the event. The Michigan bill still has to go through the Michigan House of Representatives. We are hopeful we can possibly stop it there. I'm personally working on that. The Senate version of the bill was assigned to the Judiciary Committee. We traveled there on the date of the scheduled hearing, February 20th. We were effective that date -- one Senator (Tonya Schuitmaker) committed to the bill previously changed her vote upon hearing our testimonies. Ann Marie Rogers presented compelling documented testimony and an impressive packet of information any conscientious legislator could hardly ignore. They announced the bill would not be leaving Committee. That was a victory, or so we thought. Just a few days later, we learned that a very high priced, high pressure lobbyist had been engaged by BEST FRIENDS ANIMAL SOCIETY. The Committee members were leaned upon and this time it made it out of committee, over Senator Schuitmaker's vote. We were disturbed on public safety grounds, but the missing dynamite component was something I did not then realize that all should realize -- the BEST FRIENDS ANIMAL SOCIETY was a direct continuation of the cult to which many law enforcement officers have traced a disturbing pattern of blackmails, human trafficking, placing people in compromising positions. The Best Friends Animal Society has not even tried to hide their connections to a cult that reportedly involved major criminal cases such as that of David Berkowitz and Charles Manson. They have tried to cleanse themselves of the Manson connection by pointing to an early book on the Manson cult by Ed Sanders. When he brought out the Process Church connections, the cult employed a time honored tactic of filing a lawsuit and the American publisher cowardly recalled all copies to get rid of the litigation. The British publisher, however, stood by the well researched and documented book (if you buy it, be sure to either locate the British edition or the pre-purged edition). At any rate, me, an animal lover with 3 dogs and 1 cat has learned more about the Best Friends Animal Society and its sorry roots and explosive spread than I ever previously wanted to know. I would not have suspected, even though I knew the Animal Rights Movement was always an important component of the New Age Movement. Oh, and what does the PROCESS CHURCH OF THE FINAL JUDGMENT believe? They have three branches representing, they say their 3 different Gods: Jehovah, Lucifer, and Satan. "Christ," they say aims to reconcile all 3 into himself, whoever and whatever their "Christ" may be. You may be sure it is not Jesus! "Nice folks" -- be aware. There are undoubtedly some involved in the now burgeoning BEST ANIMAL FRIENDS SOCIETY who are unaware of these origins and as so many other New Agers did over the years, walk away when they learned the truth. There are others who continue to take those into "deeper levels" of their occult belief system. I believe now and always have that everybody deserves one kind warning. After that I'm not going to beat people over the head with the evidence. Nor will I interfere with their "Constitutional Right" to "go to Hell if that's where they are Hell bent on going." I so hate to see the lovely animals used for their purposes. God had second thoughts about having had created the human race (Genesis 6:6). I'm sure he never repented of creating cats and dogs. The Bible also says in Proverbs that "A righteous man regardeth the life of his beast." You may be sure that the ultimate goal of increasing the population of pit bulls is not to help the human race. Perhaps it is more aptly in line with the New Age goal of human population reduction?